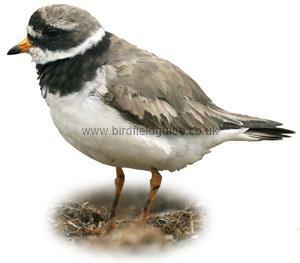 In winter the Ringed Plover forms small flocks often with other small waders such as Dunlin or Sanderling. The bird is well known for it's broken wing display, acted out in order to lead predators away from the nest. Ringed Plover in summer plumage. Note the bright orange bill and legs and the bold black breast band. This bird is in full summer plumage. 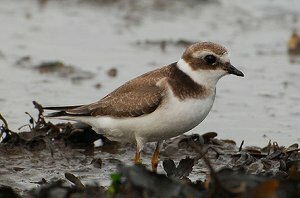 The Ringed Plover is a small bird with a sandy brown back, black band around the neck and a short orange and black bill. The head profile with white neck band showing is particularly distinctive, with the brown backs and white wing flash the Ringed Plover is easily recognised in flight. In winter the birds black markings are much duller, the bill no longer orange and the legs are not so bright. If this was a Little Ringed Plover there would be a white line across the forehead. 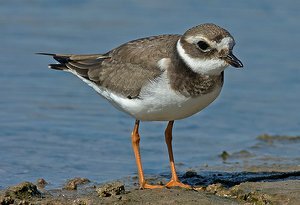 The Juvenile Ringed Plover is similar to an adult in winter plumage however the breast band does not meet in the middle and it's legs are usually duller. The white stripe above the eye separates it from a Juvenile Little Ringed Plover. Ringed Plover or Little Ringed Plover? 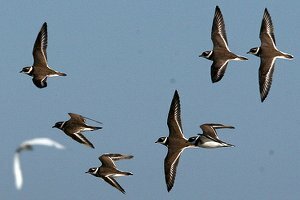 The Little Ringed Plover (Left) has a white line between crown and black forehead, this is visible in both summer and winter plumage. It also has a bright orange eye ring. The Ringed Plover (right) has a bright orange and black bill in summer although this is dull or black in winter. 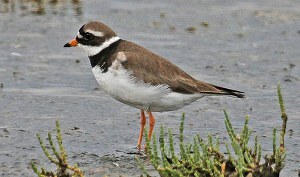 It also has bright orange legs in summer the Little Ringed Plover has dull pink legs. A widespread resident breeding bird and migrant throughout Europe and the UK. A Summer visitor to the very North of Europe. Breeds on sand and shingle banks near beaches or inland water. In winter is most often found on large beaches.